Okay.. So you know I have Zoya Posh on yesterday and matte chip real fast. I intended to polish a top coat on the tip but then, I had an idea. Since I will be hitting the clubs tonight, I thought I could come up with a design which can only be seen in the club or under any black light. Under normal light, it looks kind of meh. But when it is under black light, you can see glowing leopard prints! Ain't I genius? Okay, maybe not a genius but definitely creative! I used L.A. Girl Matt Pink for the spots and Strobe Light for the outline. I hope you like this design! Good afternoon everybody! It's still CNY and I'm still busy visiting relatives! School just started too and everything's just so packed! Gosh.. Since it is still CNY, I decided to do a nice matte red. This is Zoya Posh. Isn't she lovely?? Hello everybody! Happy Chinese New Year (CNY)! Yesterday was CNY eve, a day where family member get together for a reunion dinner. Today is the 1st day (chu yi) of CNY and we, Chinese, usually visit our paternal relatives on this day. Married couples will have to give a 'red packet' aka 'ang bao' to children or adults who are unmarried. It is up to the couple how much money they want to give. The 2nd day (chu er) of CNY will be visiting the maternal relatives. From the 3rd day onwards, we usually visit friends or invite friends over. Without further ado, here is my CNY mani. Since CNY is always a season of red and gold, I decided to do a simple red and gold french manicure. The base used in this mani is OPI Passion. For the tips, OPI DS Couture and China Glaze Midnight Kiss were used. Hello everybody! I'm sorry that I couldn't update this post earlier! I've been so busy preparing for school and Chinese New Year. Since CNY is approaching, I decided to bake some cookies for my family and relatives. Some of my friends wanted to try some and I made 2 batches. It seemed like a lot but it was gone, quickly! Well, today I have an awesome multi-chrome mani for you! 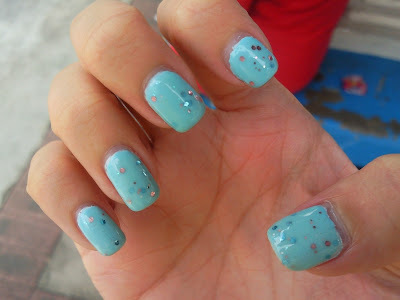 It's the all famous Sally Hansen Turquoise Opal! 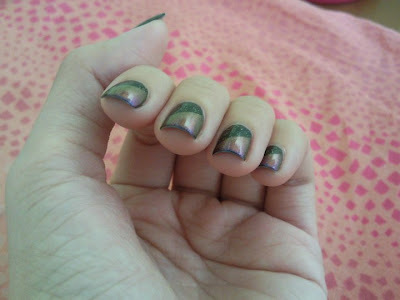 The base for this mani is Color Club Nothing But Truffle with Orly Prisma Gloss Gold as top coat. After a day of wear, I got bored and decided to polish Sally Hansen Turquoise Opal over. I got this from the 'evil' ebay for almost $40 (including shipping charges)!! It is so pretty that I want it to wear it forever! Hello everybody! Today I have a splatter mani for you! This is my very first attempt to do one and it is a very messy mani. I use a Yakult straw here as I do not have a regular (Mac Donald) straw. My polish ladies have done this mani using different kind of straws. From what I have observed so far, regular straw seems to give the best splatters. I will give another attempt using a regular straw next time. Sorry it got a bit messy and I didn't do a proper clean up! OPI Alpine Snow is used as the base. 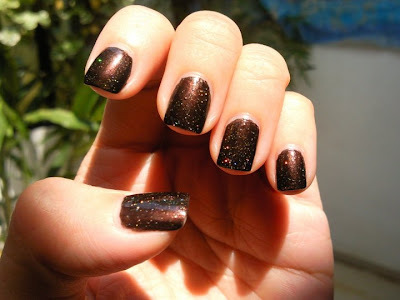 The splatters consist of OPI Midnight In Moscow, Big Apple Red and Zoya Gloria. Hello everybody! Today's post is backdated. 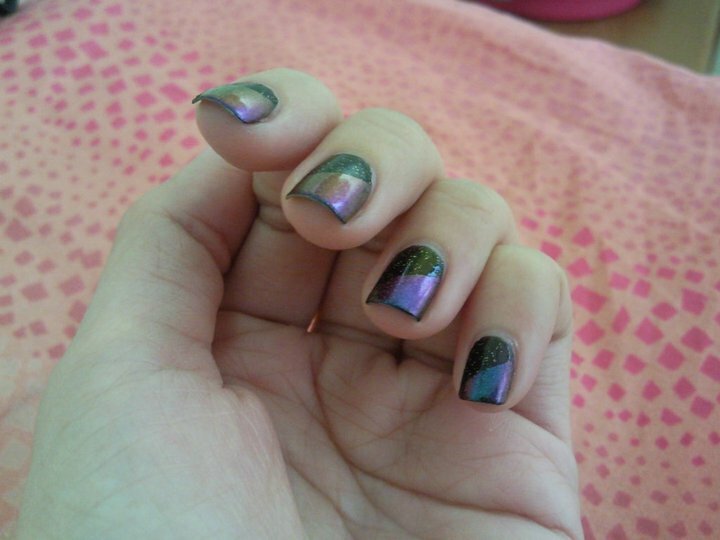 This was my very first mani just before I became totally obsessed with nail polish. It was done by L.A. Colors Orange from Intense Collection and L.A. Girl Matt Pink. I think I am going to have a huge haul coming in this month. I have to cut it down my expenditure on polish!! Sorry I have been busy lately preparing for my new term. I promise my next post will be on mulit-chrome! And it is a HTF (Hard To Find)!! Stay tune! Hello everybody, how are you all doing today? Today's mani is Deborah Lippmann (DL) Glitter In The Air (GITA) over Color Club Factory Girl. GITA is one of the very highly raved DL polish. The polish is very sheer and does not stand out when worn alone. However, once you layer over a similar colour base, it is just WOW. 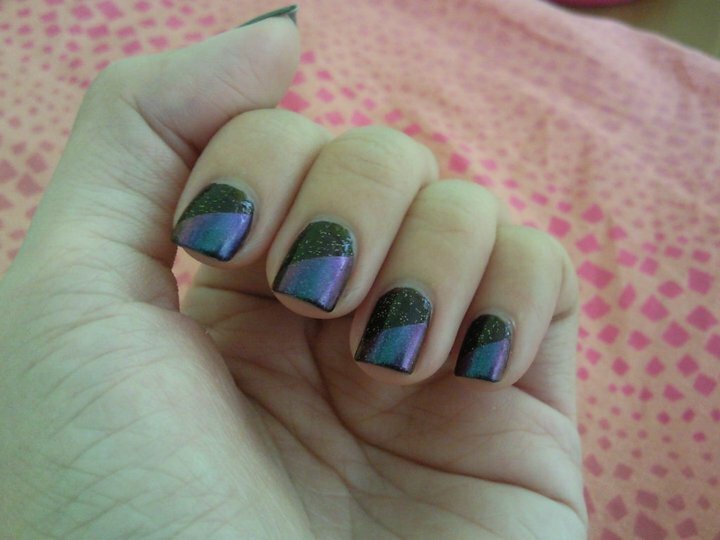 GITA is commonly layered over China Glaze Sea Spray but in my case, I layered it over Color Club Factory Girl. Since Factory Girl needs at least 3 coats to build, I put one thick coat of it over OPI Alpine Snow. Then, it was 2 coats of GITA over Factory Girl. Can you see the awesome glitters? Besides the peach and blue hexagon glitters, there are actually blue/green micro glitters in this polish. I promise better close ups when I try GITA over Sea Spray! P.S. 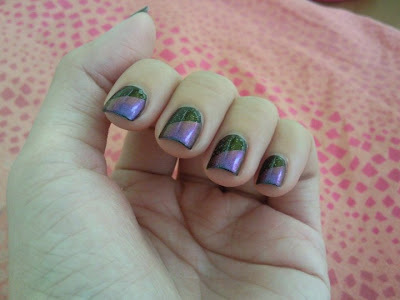 My Clairvoyant post is now updated with swatches! Hello everybody, good afternoon! How are you all doing in the new year? Have you had a good start in 2012? Today's mani is the curtain design. The lighter blue is Orly Gumdrop and the darker blue is Snowcone. Happy new year everybody! Leave all the bad past behind and start afresh this year! For those who made terrible mistakes, learn from them and do not let history repeat again. For those who had a good year, I hope you will have a better year in 2012! 2011 wasn't exactly a very good year for me. I had a major break up which really took me a while to get over. Although I have to start from scratch again,I decided to go back to my studies after some serious thought and determination. I wanted my new year mani to be super bling or unique but I didn't really have the time to do. So I decided to try some effects. I used China Glaze Liquid Leather as base. Then, I feathered CND Jade Sparkle from the base to about the middle of the nail and 24K Sparkle from the middle to the tips. It is really pretty because there is a colour shift from Jade Sparkle and you can really see the gold flakes from 24K Sparkle. It usually looks like this in shade.